Designed as Double-Stack 1.8 metre Decking Handrail, a single piece can also be used as Baserail. We suggest fitting 41mm spindles between two lengths of rail ( both "hollow" side down ) - screwing straight through the rail into the spindle; Then use a third length of rail on top to give a smooth handrail surface, to shed rainwater, and to give an aesthetically more robust appearance to the handrail. 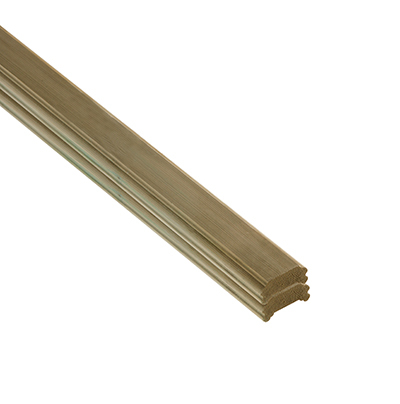 This rail features a minimalistic design that can be used as both a base-rail and a hand-rail. Cheshire Mouldings Treated Decking components are only designed to fit other specific components in the range. Whitewood Pine is a natural material - variations in knots, colour and grain should be expected - They are not a fault. - We cannot be held responsible for any variations in machined DHNEW1.8 Deck Handrail sizes, pattern, construction, grading, moisture-content, treatment, certi­fica­tion, knots, colour or grain. We are able to supply Benchmark DHNEW1.8 Deck Handrails with our Chain of Custody Certi­fica­tions - CoC. - We cannot exchange any Pine Stairparts once ordered; Cheshire Mouldings DHNEW1.8 Double-stack Handrails are supplied as a Special Order. Payment - We can take Debit Card, BACS, Cash, Cheque or Credit Card payment online for DHNEW1.8 Cheshire Mouldings Treated Deck Handrails. 5.5Kg is used as a shipping weight, which may include wrapping in a bubble-wrap or corrugated-paper type material, to send by carrier.